TWO pupils have scooped prestigious international awards after their school spread the message of peace and goodwill across the borough. It is one of the first schools in England to pursue the Peace Education Programme written by Glenda Thornton, associated with The World Peace Prayer Society and The Allanton Sanctuary in Scotland and has been active in the promotion of The World Peace Flag Ceremony throughout Oldham. As part of the work to spread the message of international peace and community cohesion, three classes — Year One, Two and Five — took part in the 12th Annual Peace Pals International Art Exhibition and Awards, a Programme of The World Peace Prayer Society-Nurturing inner peace and global awareness in youth around the world. 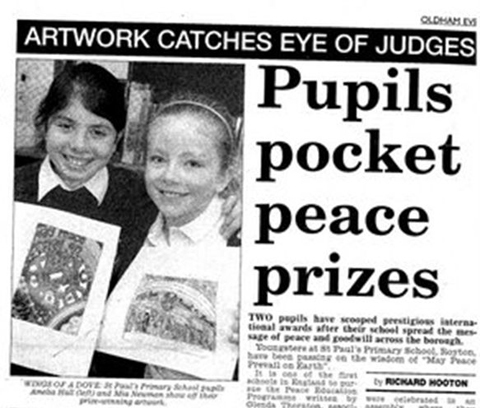 They were asked to design and create a piece of artwork which celebrated and illustrated the message, May Peace Prevail On Earth, and incorporated the theme for the 2009 Peace Pals International Exhibition and Awards. Judges received 4,000 entries from 33 countries, and two talented pupils emerged triumphant, with Amelia Hall (10) awarded a ‘Highly Commended’ and classmate Mia Newman (10) granted the ‘Ambassador for Peace for England’ award. The duo’s achievements were celebrated in an assembly, where they received certificates for their artwork. Jane Jefferson, who coordinated the project and delivers the Peace Education Programme in the school, said: “We are very proud of our pupils’ achievement. “We at St Paul’s are dedicated to the vision of community cohesion and international peace. “Our links with The World Peace Prayer Society is helping us as a school to move forward in our work towards a happier, more contented and peaceful society.